Simply put, Prowler is a sunny-day lifestyle statement, not a mere means of transportation. Once well-heeled buyers paying over list were sated, prices stabilized closer to sticker. Lack of cargo room excepted, Prowler is as practical as most any 2-seat roadster in its price class–which is to say, not very. Still, few cars generate more smiles per mile, and you don’t even have to drive it to enjoy it. Styled like a roadster of the 1930s, but redone in the mode of the ’50s, the Prowler looked like no other modern car on the road. Motorcycle-type front fenders, for instance, moved along with the front wheels. Like the Viper before it, Prowler had been a show car–but one later made ready for the street. Appearances aside, the Prowler’s technology was strictly up-to-date. About 900 pounds of aluminum were used–in the hood, front side panels, doors, rear deck, frame, bumpers, front-suspension wishbones, and seat frames. Plastic was used for rear body panels, rocker panels, and front fenders. Borrowed from Chrysler’s LH sedans, the 3.5-liter V6 engine produced 214 horsepower. Rear-wheel drive helped impart a more traditional hot rod feel. Prowler’s sole transmission was a rear-mounted automatic unit with Chrysler’s Autostick manual-shift feature, which permitted manual gear selection when desired. Antilock brakes and traction control were not available, though brakes were all-disc. Front tires were 225/45VR17 size, while the back end held massive 295/40VR20 rubber. Both tires had run-flat capability–essential because there was no room for a spare tire. 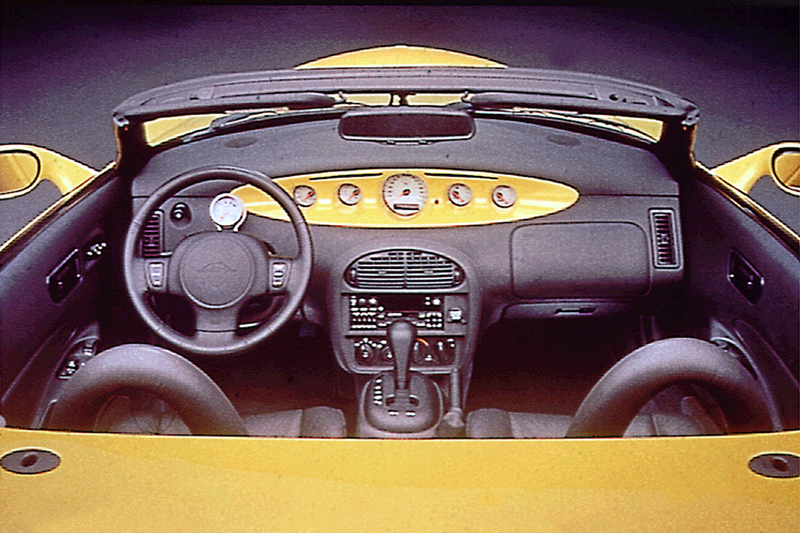 The retro theme continued into the interior, which featured a full complement of gauges at the center of the dashboard, in an elliptical pod. 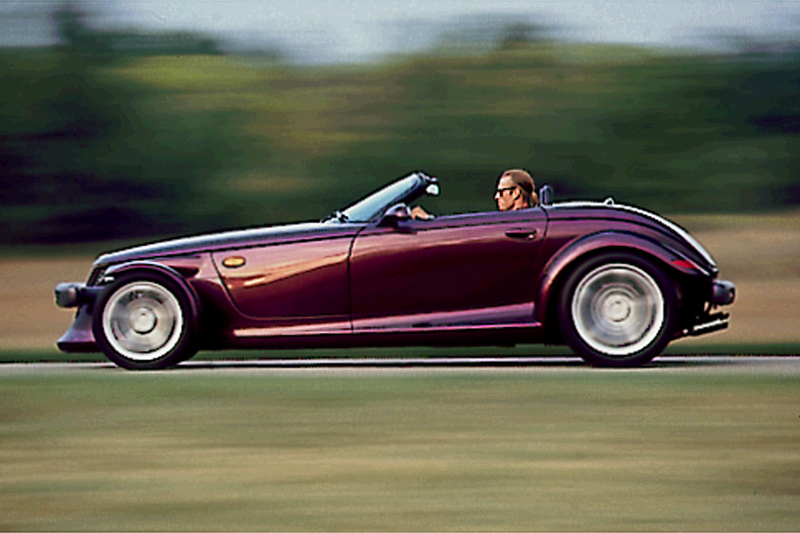 That pod matched the body color–which was purple-only in the Prowler’s first season. A tachometer was mounted atop the steering column, simulating the look of aftermarket speed equipment. Standard equipment included air conditioning, a tilt steering wheel, cruise control, 6-disc CD changer, and a defroster for the convertible top’s glass rear window. Power windows, locks, and mirrors also were standard. 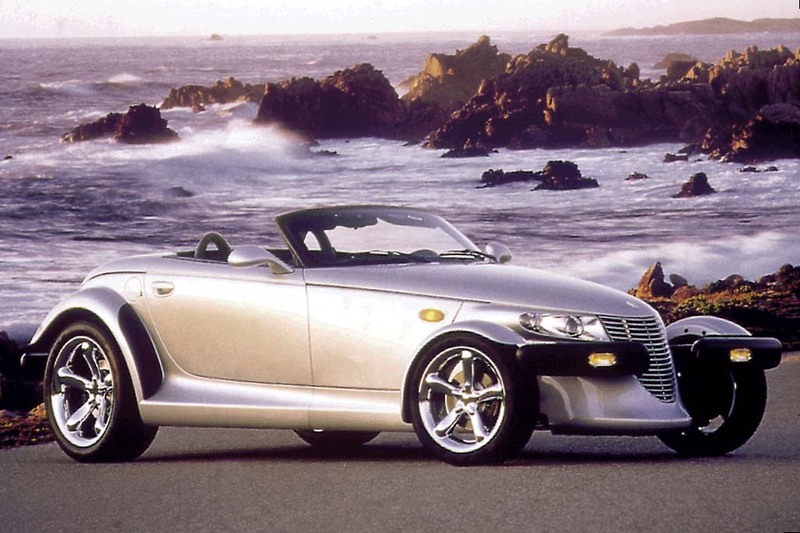 No ’98 models were issued, but Prowler would be back for 1999. Reintroduced in spring of 1998 as a ’99 model, Prowler had a new V6 engine that produced 253 horsepower–39 more than in 1997. That engine came from the Chrysler 300M and LHS. As before, the sole transmission was a rear-mounted automatic unit with Chrysler’s Autostick manual-shift feature. Antilock brakes and traction control remained unavailable. 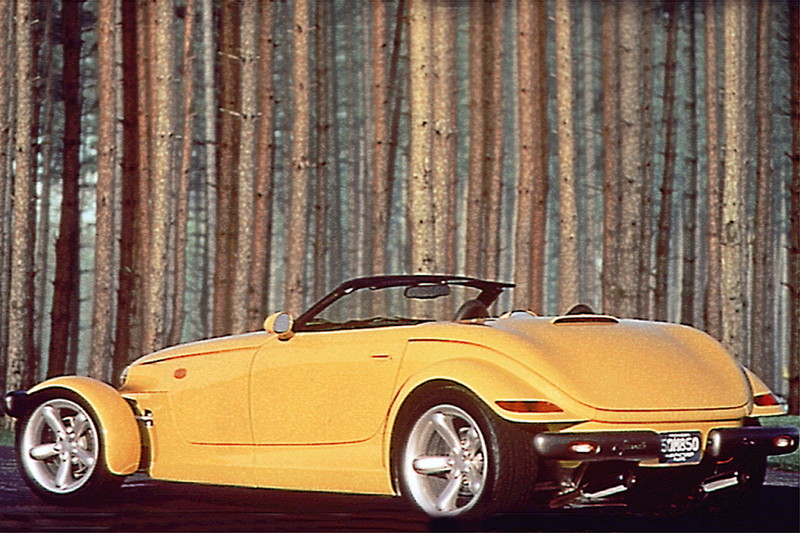 In addition to the original purple body color, the revived Prowler came in yellow, black, or red. Chrome wheels were newly optional, too. Suspension revisions were the major changes this year, along with new body colors. Springs were softened and shock absorbers recalibrated, in an attempt to improve ride and handling. Silver joined the body-color list, replacing yellow and purple. A new chrome bezel and leather boot went on the gearshift, and an automatic-dimming mirror contained an integral compass and trip computer. Adjustable shock absorbers and new colors are the only changes for this limited production model. Production ceased at the end of the year. Inca Gold replaced Mulholland Blue midyear as an option to orange or silver. The last Prowler was put together on February 15, 2002. 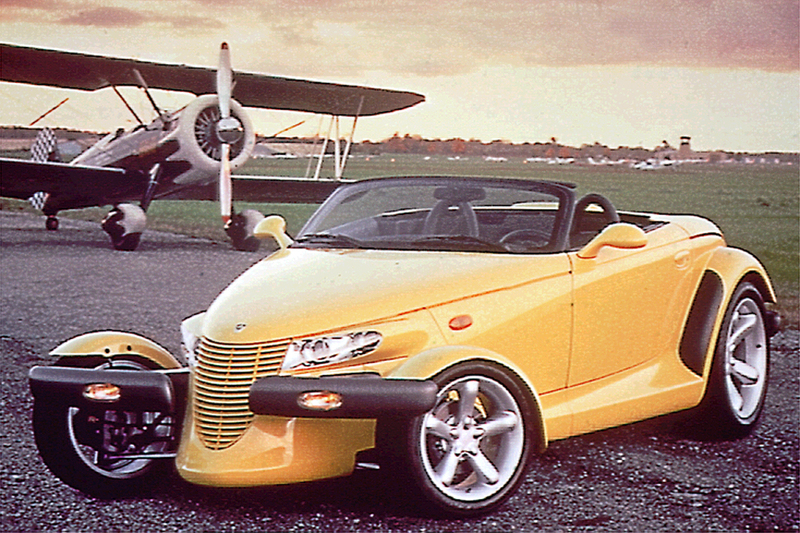 A 214-horsepower 3.5-liter V6 engine propelled the original Prowler. When it returned for 1999 after a year’s absence, a stronger (253-horsepower) version of the 3.5-liter V6 went beneath the hood. All Prowlers have a rear-mounted 4-speed automatic transmission with Chrysler’s Autostick manual-shift provision. What can you call the Prowler? It’s not just an automobile. No, this roadster is an unabashed tribute to form over function–an exuberant celebration of the car as art form–much like the vintage street rods and custom cars of the past that it seeks to imitate. Style and spirit it has in abundance, but the driver has to dispense with a few commonplace amenities–most notably luggage space, which is virtually nonexistent. At first, it looks like little more than the thinnest briefcase will squeeze below the lid of what would otherwise be a trunk. By planning carefully, two or three small, soft bags can pancake into that cargo space, enveloped between the rear bulkhead and the decklid. Dealers actually offered a small, matching trailer to augment the minimal storage space. As might be expected of a professionally engineered car, Prowler accelerates more smoothly, rides softer, and takes corners with more control–devoid of body lean–than any home-built hot rod. Altogether, the feeling from behind the wheel is still unique among production automobiles. Prowler might look like a dragster hot rod, but its handling is quite sports carlike. It’s nearly flat in turns, with unexpected balance and grip, and firm, no-surprises steering. Though the V6 does not pin you to your seat, it offers plenty of power and the exhaust note is a hearty rumbling roar. Tire and wind noise are prominent at highway speeds, but only seem to add to the excitement. Gas mileage has varied. We averaged 17.2 mpg with an early Prowler, in a mix of city, suburban, and highway driving. A ’99 model got a more reasonable 22.1 mpg. Brakes are strong and easily modulated, and the 4-wheel independent suspension steps deftly over small bumps. Bigger bumps pitch occupants around in their seats–and produce body rattles, too. Getting inside is a chore, and exiting is no easier. Doors are long, but do not open particularly wide. You sit close to the floor, in supportive buckets, with the pointed prow visible through the narrow windshield. But front fenders are invisible as they turn with the wheels and bob with the suspension. Slitlike side windows and the low, “chopped” baby-bonnet convertible top kill any useful views with the top up. You have to be outside the car to fold the fabric roof, but it hides neatly beneath the hard rear deck, which is tall enough to quell much of the wind buffeting that affects other convertibles. The retro instrumentation straps a small tachometer to the steering column and strings other gauges across the center of the dashboard. Reading those requires a conscious look away from the road. Controls are standard Chrysler fare, and easy to use. Interior storage consists of a console box, a small glovebox, a single cupholder, and a map pocket behind the driver’s seat. Prowlers we’ve tested exhibited cowl shake, but no more than, say, a Mustang convertible. Fit and finish have been very good, inside and out. Cabin materials are high grade, and the paint has looked exceptionally deep and glossy. Description: Some welds that affect vehicle control and crashworthiness may have been omitted in six areas of the frame; loss of control can occur. Description: Some vehicles may have defective lower control arm ball joints, resulting in possible loss of steering control. Dealer will inspect and replace affected parts. Description: Brake-indicator-lamp circuit does not contain the required ground circuit to illuminate the lamp in the event of a brake system hydraulic malfunction. Description: Some aluminum castings used in manufacture of frame may have missed the required heat treatment; some of these frames could fracture under vehicle operating conditions. Black/red exterior color, special floormats. Silver metallic/black exterior color, silver stripes, special floormats. Deep sapphire pearlcoat blue/silver exterior color, handpainted stripes, blue convertible top. Includes bodyside stripes. Requires Inca Gold Pearlcoat Paint. Requires Inca Gold Paint Group.